This photograph! Discovered via @Baratunde and delighting me to no end. Some additional digging reveals that the woman is a performance artist, but she still chopped that onion on that train. I am fully obsessed with Harmless Harvest's Coconut Water. Be warned: once you try it, you will find it difficult to enjoy other brands of bottled coconut water. This stuff smells (and tastes) so fresh and nutty and yummy; after I've finished drinking, I save the bottles until the smell is gone (always wearing eau de weirdo around here). Yum, that coconut water sounds amazing. But I only drink sweetened coconut water! I'd have to pour out of the bottle and stir in some raw sugar syrup. 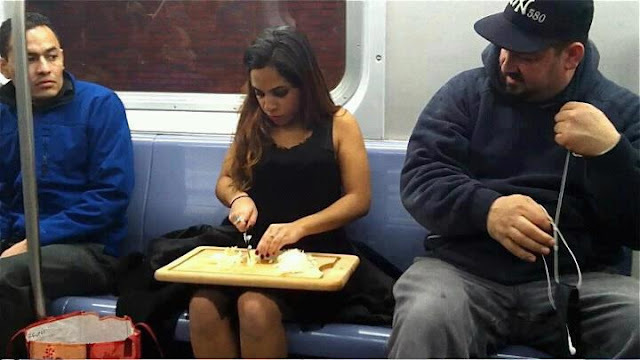 The onion lady on the subway reminds me of how a certain member of our first-year (second semester) fiction workshop used to bring a cutting board and raw vegetables to workshop as the "snack" to share. Also a whole loaf of unsliced bread, a whole unsliced salami, a chunk of cheese. The only "snack" that beat that was the time a different member of that same workshop brought two buckets of chili, which had to be heated up in the lounge microwave before being served (with toppings). Hahahahaha. There is so much I'm laughing at in this post and Preeta's comment.